The industrial sector has enjoyed a positive first half of 2011, particularly for U.S.-based issues, given a weak dollar enhancing exports. Our goal in this profile is to help investors wade through the many competing ETF offerings available. Using our long experience as an ETF publication, and nearly 40 years in the investment business, we can help select those ETFs that matter and may or may not be repetitive. The result is a more manageable list of issues from which to view and make selections. There is currently an expanding list of 20 ETFs oriented to the industrial sector with more on the way. 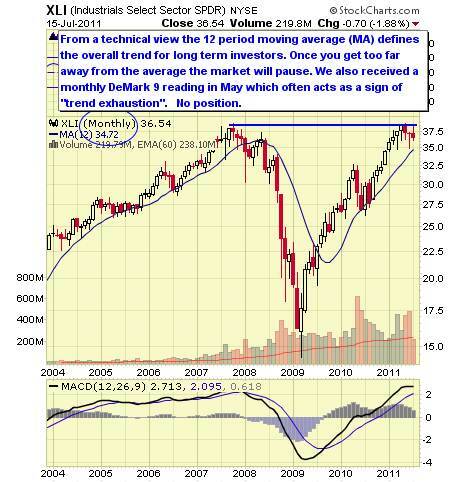 The following analysis features a fair representation of ETFs available. We believe from these investors may choose an appropriate ETF to satisfy the best index-based offerings individuals and financial advisors may utilize. We're not ranking these ETFs favoring one over another so don't let the listing order mislead you. Although we may use some of these in ETF Digest portfolios it's not our intention to recommend one over another. ETFs are based on indices tied to well-known index providers including Russell, S&P, Barclays, MSCI, Dow Jones and so forth. Also included are some so-called "enhanced" indices that attempt to achieve better performance through more active management of the index. Where competitive issues exist and/or repetitive issues available at a fee cost saving we mention those as other choices. New issues are coming to market consistently (especially globally) and sometimes these issues will need to become more seasoned before they may be included at least in our listings. For traders and investors wishing to hedge, leveraged and inverse issues are available to utilize from ProShares and Direxion, and where available these are noted. XLI (SPDR Industrials ETF) follows the Industrial Select Sector Index that contains constituents from a wide variety of U.S. manufacturers. The fund was launched in December 1998. The expense ratio is .20%. AUM (Assets under Management) is $3.7 billion and average daily trading volume is over 18M shares. As of mid July 2011, the annual dividend was $.63 making the current yield roughly 1.7% and an YTD return of 4.80%. An alternative issue FIL (Focus Morningstar Industrials ETF) was recently launched by FocusShares and Scottrade. It is too new to rate for now but clearly the fees are low and commission free trading is available for Scottrade customers. Both ProShares and Direxion Shares maintain leveraged long and short ETFs for hedging or speculation needs. 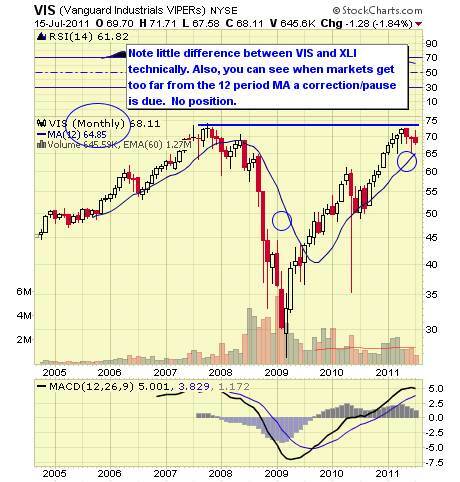 VIS (Vanguard Industrials ETF) follows the MSCI US Investable Market Industrials 25/50 Index which covers a similarly wide spectrum of constituents as XLI. The fund was launched in September 2004. The expense ratio is .25%. AUM is over $530 million while average daily trading volume is low at 64K shares. 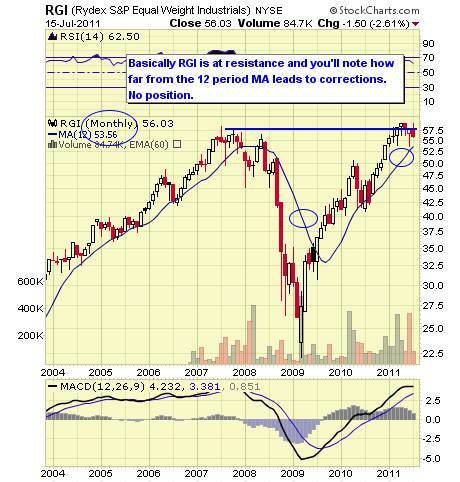 The lighter volume indicates Vanguard's emphasis on buy and hold especially with financial advisors. As of mid-July 2011, the annual dividend is $.85 making the current yield around 1.25% and an YTD return of over 5%. 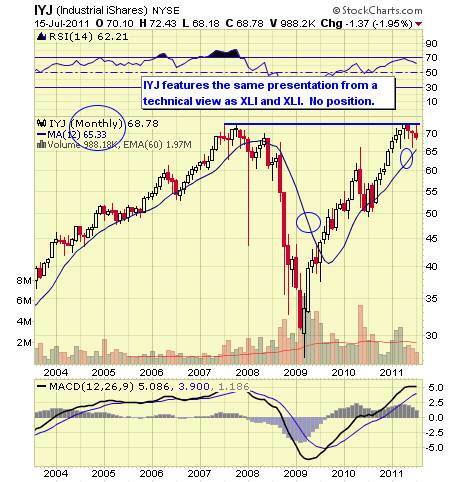 IYJ (iShares Dow Jones U.S. Industrial Sector ETF) follows the Dow Jones U.S. Industrials Index. The fund was launched in June 2000. The expense ratio is .48%. AUM is over $450 million and average daily trading volume is over 85K shares. As of mid-July 2011the annual dividend was $.83 making the current yield 1.20% and YTD return a little over 5%. EXI (iShares S&P Global Industrials ETF) follows the S&P Global Industrials Index which covers the mostly developed market constituents in the U.S. and overseas. The fund was launched in September 2006. The expense ratio is .48%. AUM is just below $250 million with average daily trading volume of 22.5K shares. As of mid-July 2011 the annual dividend was $.76 making the current yield 1.35% and YTD return 3.40%. 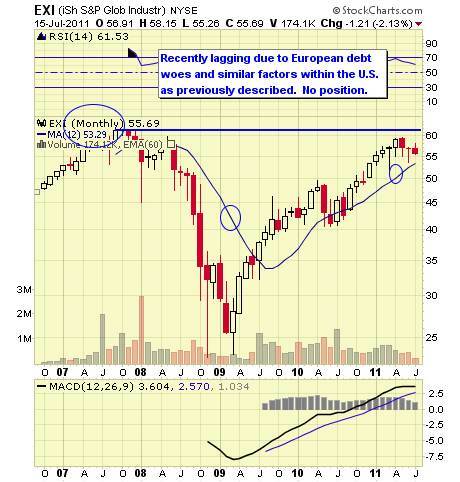 An alternative choice could be IPN (SPDR S&P International Industrial Sector ETF) which follows the S&P Developed Ex-U.S. BMI Industrial Sector Index. It was launched in July 2008. The expense ratio is .50%. AUM equal only $25 million and average daily trading volume is low at 11K shares. As of mid-July 2011 the YTD is .39%. 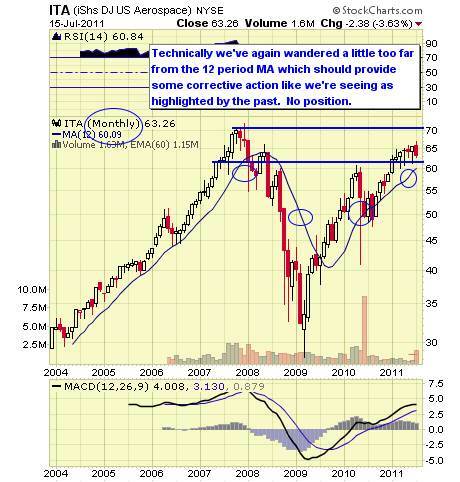 ITA (iShares Dow Jones U.S. Aerospace & Defense ETF) follows the Dow Jones U.S. Select Aerospace & Defense Index which measures this sector of the U.S. equity market. The fund was launched in May 2006. The expense ratio is .48%. AUM equal $200 million and average daily trading volume is over 40K shares. As of mid-July 2011 the annual dividend is $.54 making the current yield .86% and YTD return around 7.50%. 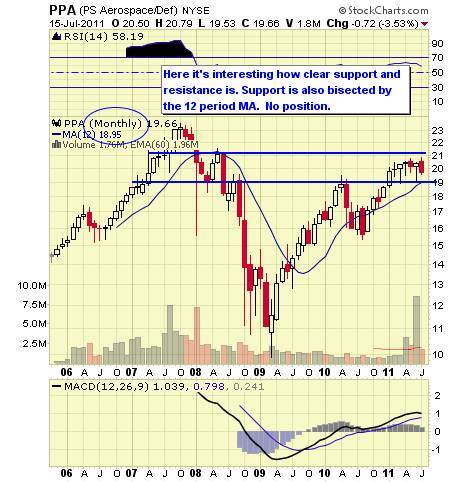 PPA (PowerShares Aerospace & Defense ETF) follows the SPADE Defense Index which also includes homeland security and the usual aerospace and defense constituents. The fund was launched in October 2005. The expense ratio is .60%. AUM equal roughly $122 million and average daily trading volume is over 170K shares. As of mid-July 2011 the annual dividend is $.09 making the current yield .44% and YTD return is over 5%. PRN (PowerShares Dynamic Industrials ETF) follows the Dynamic Industrials Sector Intellidex Index. This is another of the "enhanced" indexes which uses the same constituents as other passive indexes utilize but then applies proprietary quantitative analysis to assemble and more actively manage the index. The fund was launched in October 2006. The expense ratio is .60%. AUM equal $82 million and average daily trading volume is 32K shares. As of mid-July 2011 the annual dividend was $.31 making the current yield around 1% and YTD performance of 3.75%. 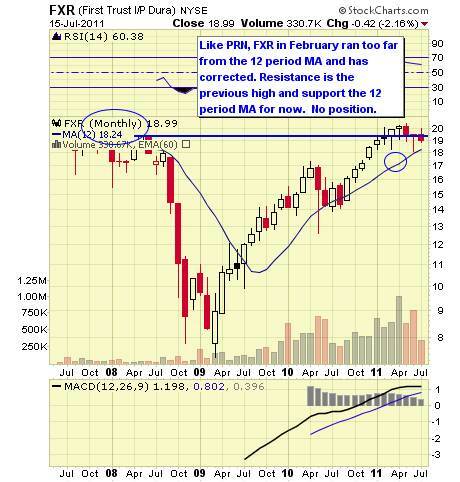 FXR (First Trust Industrials AlphaDEX ETF) follow the StrataQuant Industrials Index which, like PRN, is another "enhanced" index applying proprietary quantitative analysis applications to the basic sector. The fund was launched in May 2007. The expense ratio is .70%. AUM equal nearly $70 million while average daily trading volume is 32K shares. As of mid-July 2011 the annual dividend is $.11 making the current yield .56% and YTD return 2.75%. RGI (Rydex S&P Equal Weight Industrials ETF) follows the S&P Equal Weight Industrials Index which uniquely breaks the index into equal weightings allowing investors the opportunity to evaluate the entire sector without the heavier weightings we've seen in the bigger names where a company like GE would be dominant. The fund was launched in November 2006. The expense ratio is .50%. AUM equal $40 million while average daily trading volume is 9K shares. The company has struggled with ownership issue when the founder passed away which accounts for its low AUM. Since mid-July 2011 the annual dividend was $.80 making the current yield 1.40% and YTD return 3.35%. 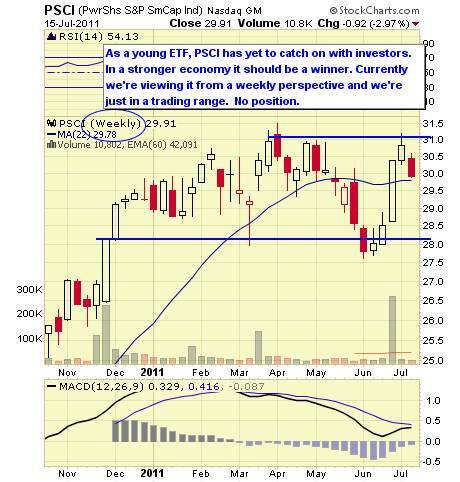 PSCI (PowerShares Small Cap Industrials ETF) follows the S&P SmallCap 600 Industrials Index which consists of those industrial subsector constituents from the overall index. The fund was launched in April 2010. The expense ratio is .29%. AUM equal $28 million and average daily trading volume is under 7K shares. As of mid-July 2011, the annual dividend was $.15 making the current yield .49% and YTD return of -.30%. The industrial sector has enjoyed a positive first half of 2011 particularly for U.S.-based issues given a weak dollar enhancing exports. Also, larger multinational companies have enjoyed better overseas growth based on positive and superior economic internals in those countries. There is a lot to choose from in terms of indices linked to ETFs. Some are passive and duplicative relatively. It's essential to remember it's really a game of battleship for sponsors seeking to be first to a sector space or just being competitive in the space. This is their business interest apart from your investment interest. You should always ignore their interests and align your choices with what serves your objectives best. Investors should note that in a rising market particularly ETFs linked to enhanced issues will tend to outperform conventional index linked issues. 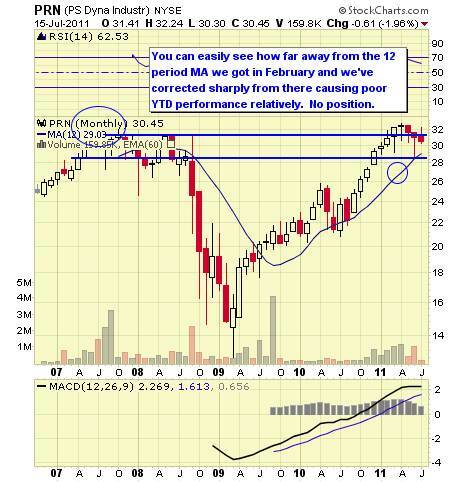 I've not done enough analysis to determine their relative performance during down market periods. New ETFs from highly regarded and substantial new providers are also being issued. These may include Charles Schwab's ETFs and Scottrade's Focus Shares which both are issuing new ETFs with low expense ratios and commission free trading at their respective firms. These may also become popular as they become seasoned. For further information about portfolio structures using this or other ETFs see www.etfdigest.com .